It’s one of the most meaningful and important pieces of clothing that you will ever wear, so here are some important tips for choosing it. What to Consider When Buying Your Wedding Dress? There are a number of factors to consider when you are buying your wedding dress. First of all, you want to choose a dress that suits the type of wedding you are having, such as a vintage ball gown if you are getting married in an old castle and a simple flowing dress for a beach wedding. Also, you will need to consider your budget – there is a wedding dress for every price point and it is up to you how much you want to spend. No two bodies are the same and if you want to make the most of your shape, it’s important to choose a dress that suits your body type and highlights your best features. For example, if you have a pear-shape you should look for a dress with an A-line skit which will highlight your midsection while hiding your hips. If you have a small bust, you can look for a dress with detailing and ruching in the bodice to create volume. Take a look at what you regularly wear for some hints on what flatters your body. Known your body type, so that you can search for dresses that will flatter your figure. Before shopping online, try a few dresses on at a shop. You will discover what shapes and cuts look good on you so that you can look for something similar online. Get a measuring tape and take your measurements, which can be used to identify your size. Wear the bra that you will be wearing on your special day and stand up straight, with your heels together. Understand how different fabrics feel and move, so you will be able to tell whether the dress will be soft and flowing or stiff. Watch out for poor quality scam websites that offer designer wedding dresses at prices that are too good to be true. You can spot them from the poor spelling and grammar, shady contact information and unrealistic delivery times. 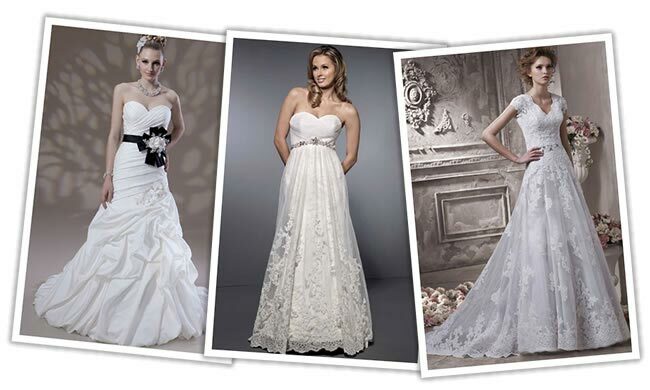 Vogue Season is a superb wedding dress maker offering gorgeous handmade wedding dresses online. They offer special weekly deals and a 100% money back guarantee and a three day return policy.